Six-time GRAMMY-winning jazz bassist Christian McBride can be likened to a force of nature, fusing the fire and fury of a virtuoso with the depth and grounding of a seasoned journeyman. 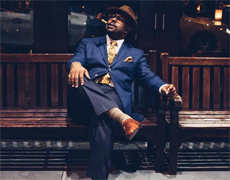 Powered by a relentless energy and a boundless love of swing, McBride's path has described a continuous positive arc since his arrival on the scene. With a career now blazing into its third decade, the Philadelphia native has become one of the most requested, most recorded, and most respected figures in the music world today.